Convert URL to MP4 and other 1000+ video/audio formats without any quality loss. Download YouTube playlist to MP4 videos at a super fast speed. Edit downloaded videos with cropping, trimming, rotating, adding watermarks, applying effects, etc. Versatile toolbox combines screen recorder, GIF maker, fix video metadata, compress video, etc. With the number of online video sites increasing at a fast pace, the content has also increased manifold. Movies, shows, and videos of all types and categories are available on these sites to enjoy them online. But in situations when you want to watch these videos offline or multiple times, you need to download them. Moreover, downloading them to your device compatible format is also important. So to make your online videos play on your choice of media player and devices, converting URL to MP4 is the apt solution. There is no dearth of URL to MP4 converters and to help you make the choice listed below are the 10 best and top ones. If you are looking for a high-quality YouTube URL to MP4 download and conversion with additional features, you need professional software not online tools. We recommend Wondershare UniConverter (originally Wondershare Video Converter Ultimate) for your best link to MP4 converter as this is an excellent video toolbox with a wide array of features. It supports 1000+ video and audio formats so that you can convert any URL to any format video or audio files. Compatible with Windows and Mac system, the program is super fast and results in lossless quality videos. 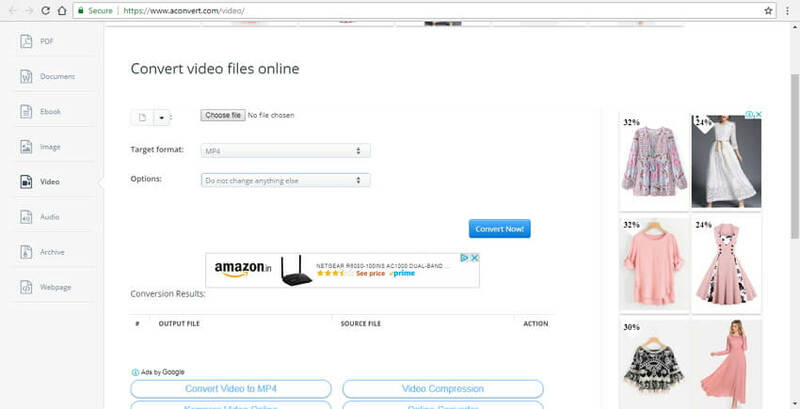 Allow converting URL to MP4, MOV, 3GP, AVI, and other 1000+ formats. Support batch processing where multiple files can be processed at a time. 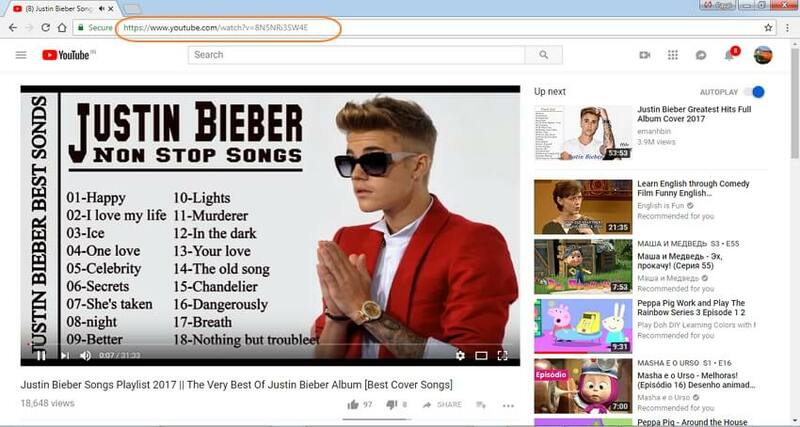 Entire YouTube playlist can be downloaded with just a single click. APEXTRANS technology results in super fast conversion speed without any quality loss. Downloaded and converted videos can be transferred to an array of devices directly. Step 1 Select and copy URL that you want to download and convert. On your PC/Mac browser, open the YouTube or any other video URL that you want to download and convert to MP4. A YouTube playlist can also be selected. Copy the URL. 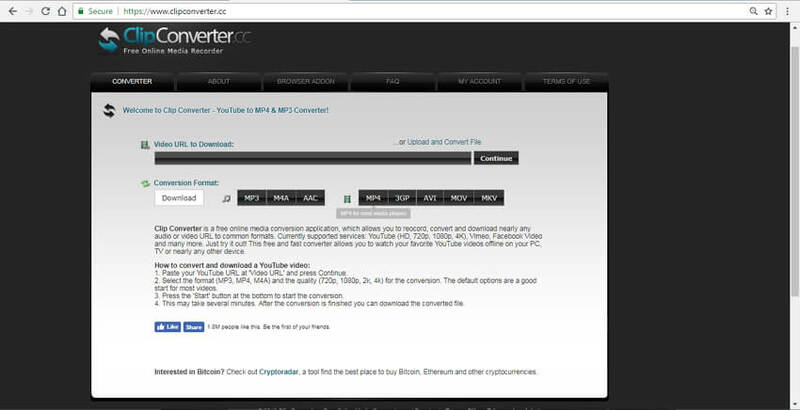 Step 2 Launch Wondershare link to MP4 converter and paste URL. Open Wondershare URL to MP4 converter on your PC/Mac. Switch to the Download tab, click on the +Paste URL button on the left-top corner and a setting window will appear. 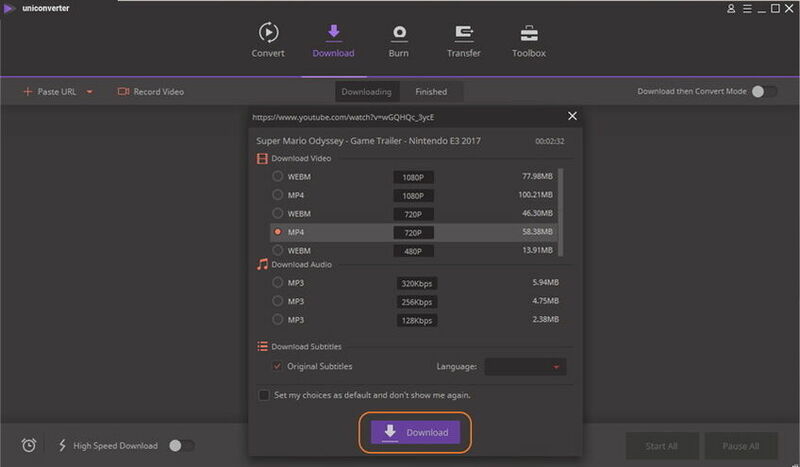 Choose MP4 format and video resolution you want from the Download Video section, click on the Download option to start downloading the video/playlist. Step 3 Convert URL to MP4 or other formats. 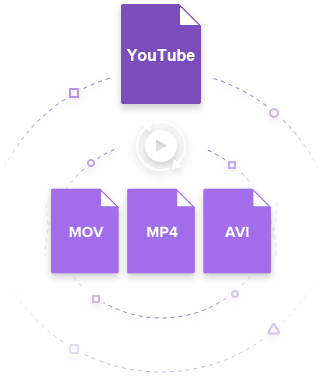 You're allowed to convert your URL to MP4 and more other video formats like MOV/AVI/MKV and more. At the top-right corner, enable Download then Convert Mode and choose video format you want from the Video tab. The downloaded file will be automatically converted to your selected format. Step 4 Transfer MP4 to iPhone/Android devices (Optional). The downloaded and converted file will appear under the Finished tab. Select the videos, right-click and choose Add to Transfer List option. Next, connect your iPhone or other devices to your PC/Mac and it will be detected by the Wondershare program and appear on its Transfer tab. Choose the videos from the Transfer tab and click on the Transfer All button, the selected files will be successfully transferred to the connected devices. This is one of the popular online programs that facilitate recording, converting, and downloading an array of audio and video URLs to popular formats. This is a free converter and some of the popular supported sites include Facebook, Vimeo, YouTube, and others. There is also an option to select the quality of the converted file. The process of download and conversion is fast and simple using this link to MP4 tool. Free to use and needs no download, installation or registration. Supports adding URL from a number of sites. Allows downloading and converting URL to MP4, 3GP, AVI, and other video and audio formats. YouTube download of HD, 720p, 1080p, and 4K supported. Direct files can also be uploaded for conversion. This online program is created and developed by a German Company known as Lunaweb Ltd. This is free to use web application program that allows converting your links to a number of audio and video formats. The program can be directly accessed from all modern browsers and is simple to use. Dailymotion, YouTube, Vimeo and other similar sites are supported for video download. Allows converting URL as well as local files to an array of audio and video formats. Supports high-quality conversion at fast speed. A wide range of formats for conversion are supported including MP4, AVI, MPG, MOV, WMV, and others. Program also available for mobile access on Windows, Apple, and Android platform. This online link to MP4 converter has a simple interface with basic download and conversion features. The program is free to use and no registration is needed. In addition to MP4, the program supports conversion to MP3, WMA, WAV, and OGG format. 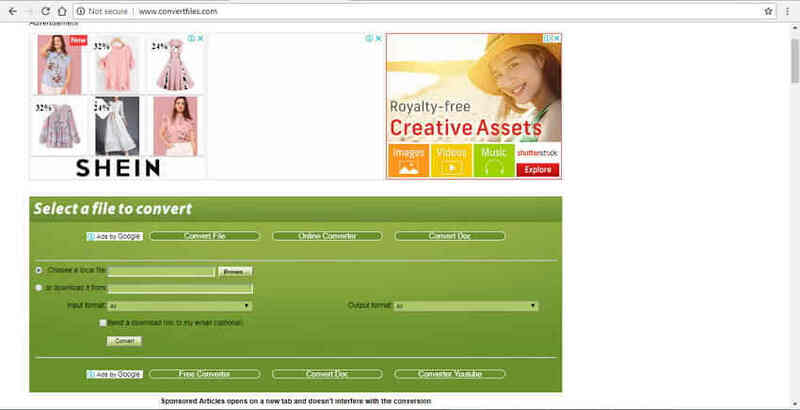 Free online converter with a simple interface. Allows adding URL for conversion in decent quality. This free online program works as a great way to convert URL to MP4 in good quality and at fast speed. You can even add the local files from your PC if needed for the conversion. The program needs no download, installation, or registration and has a simple interface. Supports adding links for an array of sources. In addition to MP4 and other videos, the program supports conversion to an array of file types including EBook, documents, and others. You can download the converted file directly from the interface or also get the link the desired mail. Maximum files size supported for download and conversion is 250MB. This free online tool allows adding URL as well as local files for conversion to MP4 and an array of other formats. The program can be accessed directly from your browser and features a simple interface. The conversion process is fast and results in decent quality output files. Files can also be added from Dropbox or Google Drive if needed. Supports adding files from URL, PC, Dropbox and Google Drive. Allows choosing output file parameters like screen size, bit, rate, frame rate, and others. A wide array of formats supported for conversion. Allows to save the edited settings of the output file for future conversion. 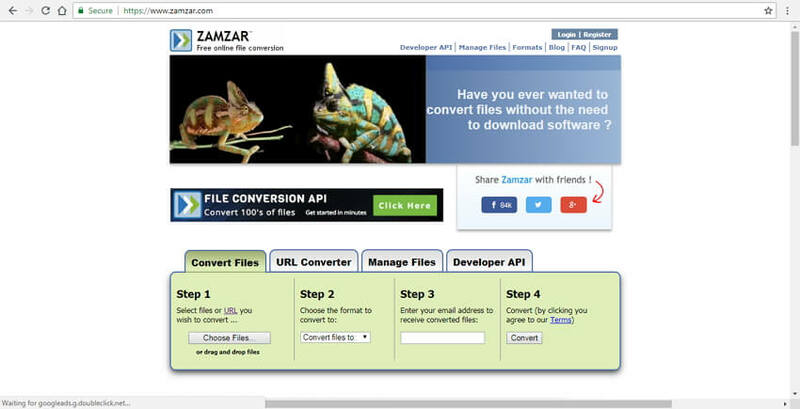 Zamzar is one of the most widely used online conversion programs that supports over 1200 file formats. It also works as an excellent tool to convert link to MP4 and other formats. Simple interface, quick conversion, no download, and free use make it favorite among the users. Allows adding files from URL as well as PC for conversion. In addition to MP4, added files can be converted to a range of file types and formats. Converted files download link are sent directly to the provided email id. Up to 50MB files can be added for conversion. Another name in the list of a top video link to MP4 converters is Convertio. The program is free to use and needs no registration. You can add files from URL, Google Drive, Dropbox or PC for conversion. Once added the conversion process is fast and output file quality is also good. The interface is simple and easy to use even for the new users. Supports adding files for conversion from multiple sources. A wide array of formats supports for conversion. Converted files can be downloaded from the program interface or can also be added directly to Google Drive or Dropbox. 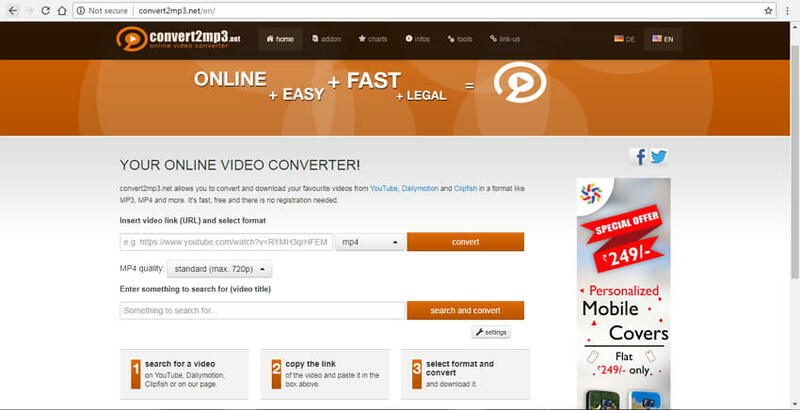 This online converter allows downloading and converting videos from URL through YouTube, Clipfish, and Dailymotion. The program is free to use and needs no registration. An array of video and audio formats is supported for conversion. There is also an option to search for the desired video link at the program interface. Allows adding URL and converting it to MP4 and other video and audio formats. Option to select output file resolution and quality. 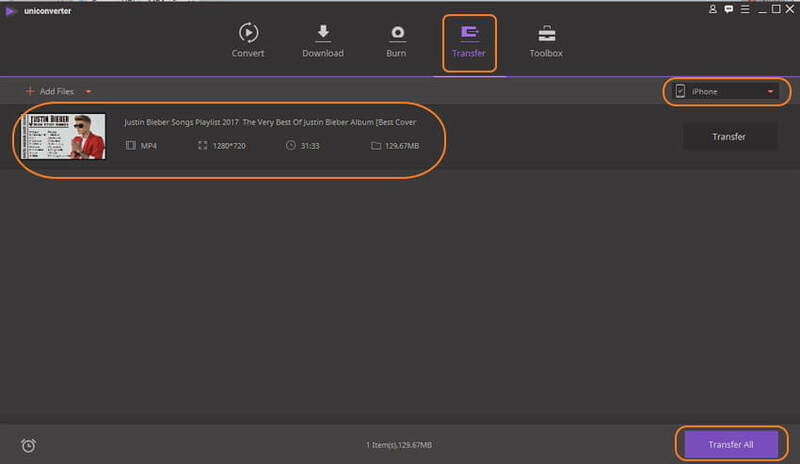 Allows to search for the desired video on the program interface. A simple and quick conversion process. 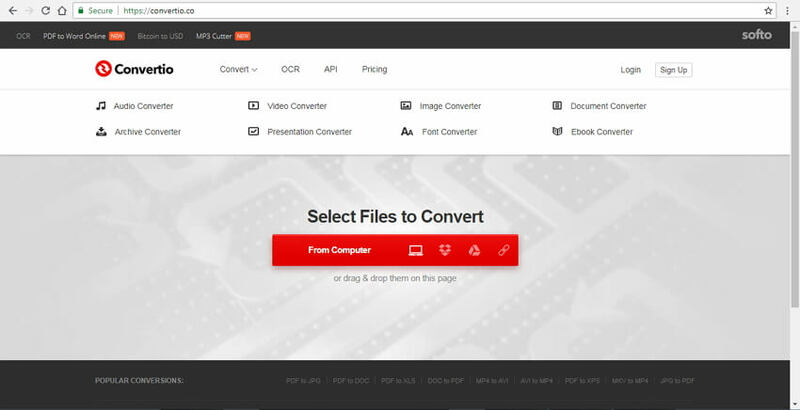 This online converter works as a decent URL to MP4 converter as it allows adding files from URL in addition to local files, Google Drive, and Dropbox. An array of popular video formats is supported by the tool as output format. The interface is simple and the conversion process is quick. Free to use online converter that needs no installation. Add URL from multiple sources. Option to change the size, bit rate, and frame rate of the output file. The output file can be downloaded from the interface or can be directly saved to Dropbox or Google Drive. Online tools to convert link to MP4 are good options, but they have their share of limitations as discussed below. Limited Download speed: Since URL to MP4 converter online works straight from the browser, it is completely dependent on the availability and the speed of the internet connection. Moreover, the URL download and conversion speed of these converters are slow as compared to the professional software as these are dependent on the speed of your net connection. 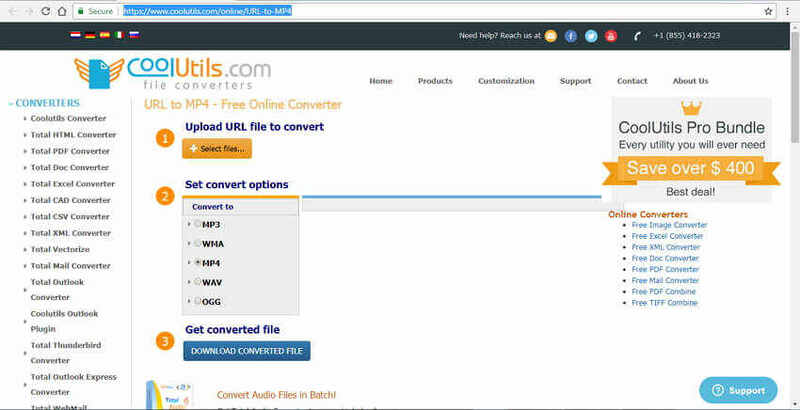 No batch or playlist download supported: Online converters come with a basic download and conversion features. Majority of these converters supports a limited file size for download and conversion. Thus, if you want to batch process your URLs or download an entire playlist, the online converter is not the right choice. Limited format compatibility: The number of formats supported by online programs is limited as compared to the professional desktop software. There is limited format support for download and conversion with these online tools. No option to choose video quality: The conversion quality using online converters is very basic and a majority of the tools does not give you the freedom to select the desired output quality.